263643 Private Joseph Wooding, 1st Northumberland Fusiliers was killed in action 23 October 1918 and is buried at Capelle-Beaudignies Road Cemetery, France. He was 29 years old and is commemorated on Cockfield War Memorial. His father, Joseph was born in Derbyshire and mother Betsy Ann in Leicestershire. The family moved around, for example in 1891 they lived at Belgrave Leicestershire, in 1901 at Gorton, Lancashire and in 1911 Arthur, William and Charles lived at the Draft Yard, Cockfield. 25 year old Arthur (surname Walker on the census return) worked as a coal miner (underground labourer). Joseph is not recorded as living at this address and has not been traced on the 1911 census. 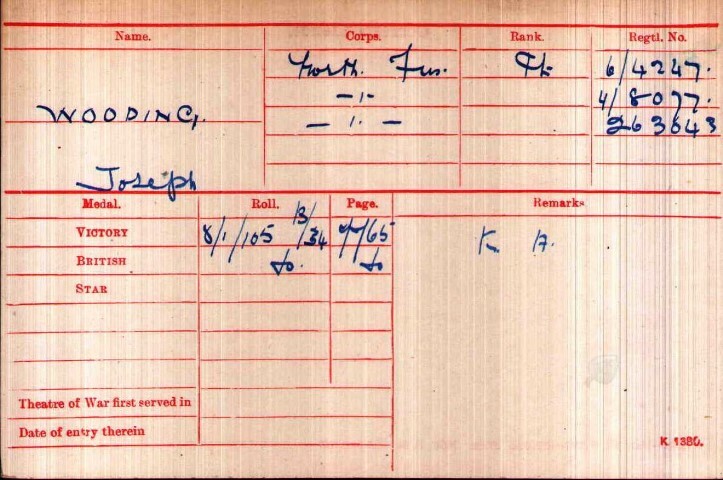 Joseph Wooding enlisted into the Northumberland Fusiliers and was given the regimental number 6/4247 then 4/8077, presumably as a result of being transferred from the 6th to the 4th battalion. Finally, he was transferred to the 1st Battalion, Northumberland Fusiliers and given the number 263043. The 4th and 6th Battalions, the Northumberland Fusiliers were part of the Territorial Force and from May 1915 came under the orders of the 149th Brigade, 50th (Northumbrian) Division. In April 1915, the Division landed in France and fought on the Western Front until July 1918 when it was reduced to cadre strength as a result of suffering heavy losses during the German Spring offensive. Private J. Wooding did not enter France until after 31 December 1915  and his service records have not been traced therefore the exact date he enlisted is unknown. It is possible that he was transferred to the 1/Northumberland Fusiliers in July 1918 when the battalions were re-organised. The 3rd Division was involved in many of the actions on the Western front and as the war was coming to an end with the Final Advance into Picardy it saw action as part of the 6th Corps, Third Army at the Battle of the Selle, 17-25 October 1918. The Fourth Army attacked 17 October 1918, at 5.20am south of Le Cateau. The centre and left of the Fourth Army crossed the ricer despite determined German resistance and the fighting was particularly fierce along the line of the Le Cateau-Wassigny railway. By nightfall Le Cateau was captured. Fighting continued 18 and 19 October with the British and French troops advancing 5 miles to the Sambre-Oise canal. The British Third and First Armies to the north of the Fourth Army maintained the offensive 20 October and in a surprise attack in the early morning secured the high ground east of the Selle. A 2 day pause followed as heavy artillery was brought up and the attack was renewed 23 October with a major assault by the First, third and Fourth Armies and it continued into the next day. The German Army was in a controlled retreat but counter attacked 24 October at the Canal de la Derination but were repulsed. Private J. Wooding was killed in action 23 October 1918. 263043 Private J. Wooding was awarded the British War and Victory medals. 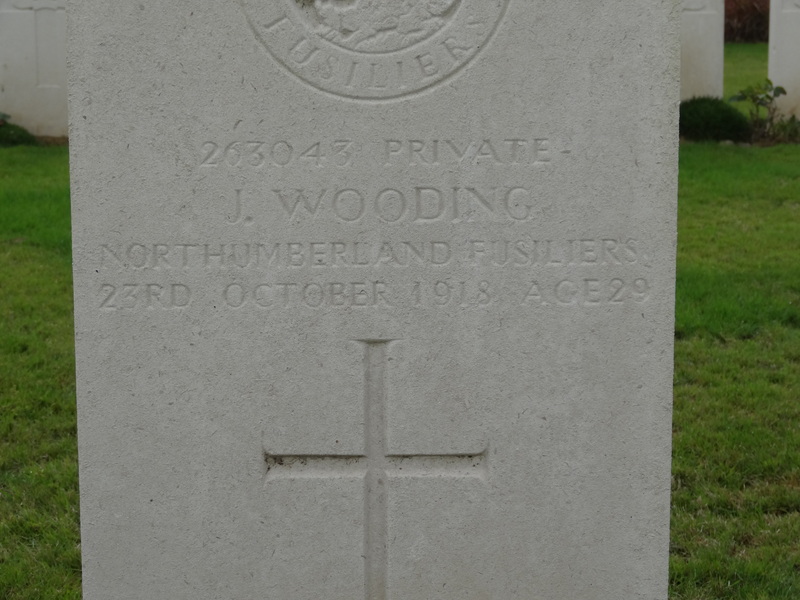 Private J. Wooding is buried at grave reference B.6 Capelle-Beaudignies Road Cemetery. The cemetery was made by the 3rd Division in October and November 1918. There are now 53 WW1 burials including 9 Northumberland Fusiliers serving with the 1st battalion.